A month ago (on October 2nd to be more exact) I had a private class (teenager students). I have downloaded one of the free chapters (chapter 3 – Being home) of Compelling conversations book. Before presenting the material to my students I told them that today we are going to talk about “my home”. I told them to think about questions they would like to ask their partners in order to get as many information as possible about their partners’ house. At the first view the topic seemed to be very easy but actually wasn’t After several minutes of thinking about questions and trying to formulate correct questions, one student said: “Teacher! I really don’t know what I should ask about her home.” If you teach English in Vietnam then you probably experienced this kind of situation. After I presented the material everything transformed into a smooth and relaxing conversation. “Roth believes that the English language itself can be liberating. Thousands of copies of Compelling Conversations have sold worldwide, and new editions are being tailored for specific countries. Roth’s longtime friend and former U.S. Assistant Federal Defender Steve Riggs ’81 worked with him in Ho Chi Minh City as he tried to establish the university and edited the book for students in Vietnam. “There are numerous approaches to language learning. Many claim to be the single best method. All of them, at some point, though, involve practice conversations. Compelling Conversations – Vietnam: Speaking Exercises for Vietnamese Learners of English serves as a useful adjunct to any of them. Designed to be a conversation starter for native Vietnamese speakers in a classroom setting, it would work well for any foreign-language speaker attempting to become fluent in English. 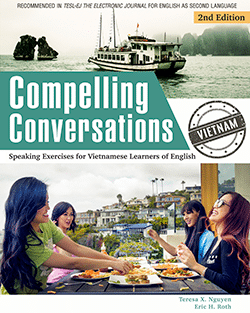 Compelling Conversations – Vietnam: Speaking Exercises for Vietnamese Learners of English is divided into chapters by theme. 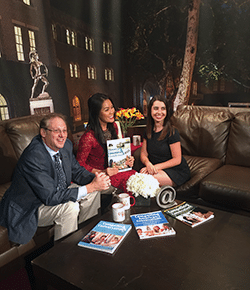 The themes include common topics like family, eating, health, personal preferences, and culture. The chapters do not get progressively harder. Rather, familiar themes are used to develop fluency, agility, and comprehension. Each of the fifteen chapters follows the same format. For example, the chapter called “Being Home” begins with fifteen suggested questions like, “Did you have a checklist when you were looking for a home? What was on it?” The questions are paired with relevant vocabulary words, such as appliance, homesick, and neighbor. Next, the student is asked to paraphrase proverbs like the Vietnamese saying, “A good neighbor is a found treasure.” A second set of more complex and thought-provoking questions follows: “Would you rather put money in a home or in a bank? Why?” The chapter concludes with a homework assignment, “My dream home,” supplied as a reproducible form. Its questions include: “How many rooms does it have?” What makes this home special?” And the assignment also includes sidebars with suggestions for individual study. Select five adjectives (spacious, cozy) for your dream home. Appendices provide templates for role playing, reproducible forms for student presentations, an academic word list, and pronunciation assignments. The book’s conversation starters are a boon for students and teachers. The open-ended and creative questions encourage students to think on their feet. They learn to transform the vocabulary and grammar they have learned into usable, natural conversation. And students should be grateful to depart from forgettable and useless old rote-learning chestnuts like “Where is the train station?” and “Do you have the yellow pencil?” Teachers will appreciate the text’s time-saving, prepackaged questions, the consistent template, and the relevant content, which can serve as a lesson plan guide or textbook. The authors may be forgiven for fudging a bit on the elements that make this book germane to the Vietnamese student. There are a few pronunciation tips: “Open the mouth wider to speak English than Vietnamese. Speak slower. Pay attention to word endings.” And there are photos of Vietnamese people scattered throughout the sidebars. “Roth and Aberson return with the next installment of their Compelling Conversations series (Compelling Conversations – Vietnam: Speaking Exercises for Vietnamese Learners of English, 2007), presenting conversation topics, activity ideas and interesting quotes for Vietnamese students of the English language.